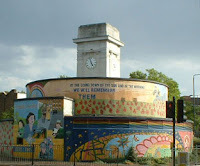 A group of interested residents and the Stockwell councillors have come together to establish a Friends group for the Stockwell war memorial. The objective of the group is to lobby the council to make repairs to the stonework lettering on the war memorial and improve the general look and feel of the site, such as the paintwork on the underground shelter. The organisation is being set up with an informal steering committee of Naomi Klein, who has written a book on the memorial, and Sheila Dartnell whose great-uncle is remembered on the cenotaph. They are being supported by Cllr Alex Bigham on behalf of the Stockwell councillors. The clock tower cenotaph was built in 1922 and commemorates the names of 574 local men who died in the First World War. The names on the memorial were put forward after the war by friends, family and neighbours of those who lost their lives in the bloodiest war in history. Behind each and every name is a man, and every man had a story. And in many cases, the name carved at Stockwell is the only thing left. The inaugural meeting of the group will be held on 14th September at 7pm at the Stockwell Community Resource Centre, 1 Studley Road (just to rear of the tube). All are welcome to attend.